The Museum Queeries research team and The University of Winnipeg welcomes Wiradjuri researcher Dr. Sandy O’Sullivan*, (Batchelor Institute, Northern Territory of Australia), as the keynote lecturer for the Museum Queeries: Intersectional Interventions into Museum Cultures and Practices workshop, which runs from June 2-4, 2017. 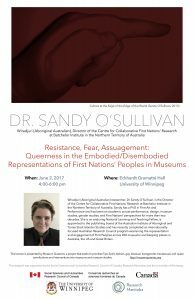 Dr. O’Sullivan’s keynote lecture, titled Resistance, Fear, Assuagement: Queerness in the Embodied/Disembodied Representations of First Nations’ Peoples in Museums, is on Friday, June 2, 2017, at 4:00 pm in Eckhardt-Gramatté (EG) Hall at UWinnipeg. This lecture is free and open to the public. It will be followed by a public reception from 6:00 – 7:00 pm in the EG Hall Foyer. O’Sullivan’s lecture, will discuss research she has undertaken for the last six years supported by the Australian Government. This study, which explores the representation and engagement of First Nations’ Peoples in the national museum space, led O’Sullivan to visit over 470 museums across Australia, the United States, and Great Britain. O’Sullivan explains that, informed by a history of mistrust between Aboriginal Peoples and museums practices, the research began through discussion with Aboriginal Elders. One Elder urged a reversal of the intense scrutiny that museums have placed on Community, by suggesting that these institutions be required to articulate what works? in representing First Nations’ Peoples across the museum space. At another meeting, an Elder talked about the importance of an expansive and diverse representation where their lives are not reduced to difference or the exotic. *Wiradjuri (Aboriginal Australian) researcher, O’Sullivan, is the Director of the Centre for Collaborative First Nations’ Research at Batchelor Institute in the Northern Territory of Australia. O’Sullivan has a PhD in Fine Art and Performance and has been an academic across performance, design, museum studies, gender studies, and First Nations’ perspectives for more than two decades. She is an enduring National Learning and Teaching Fellow, is appointed to the publishing board of the Australian Institute of Aboriginal and Torres Strait Islander Studies and has recently completed an internationally-focused Australian Research Council program examining the representation and engagement of First Peoples across 450 museums and keeping places in Australia, the US and Great Britain.